In this day and age, many museums and archives are struggling to show the impact of their collections on life today. Most people see the value of keeping historical records to learn about the past, but it can sometimes be a struggle to see how those curiosities affect your day to day life. Did you skip the first paragraphs to look at this photo? You aren’t alone. But they do exist and they do make a big impact of the lives of average citizens. Take, for instance, the retiree who is filing for Social Security or a military benefits They may need a copy of their Decree of Divorce to prove their eligibility. 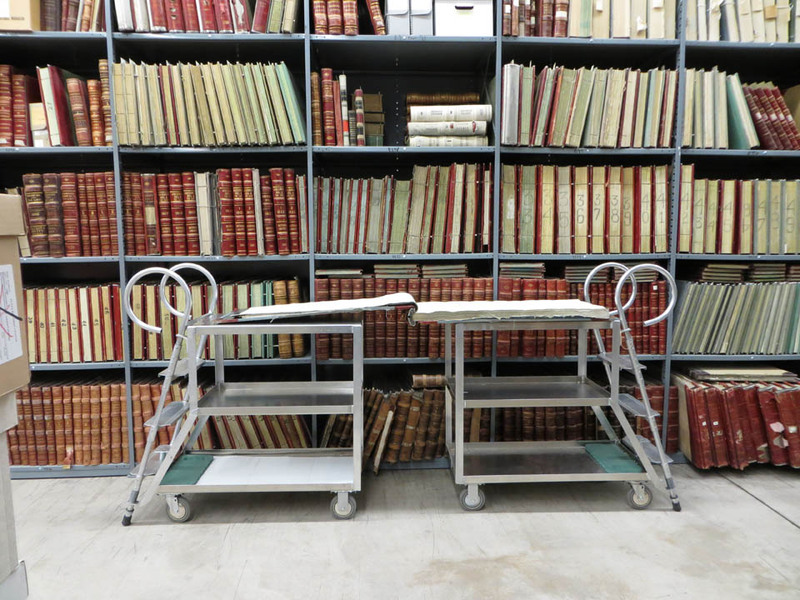 In many cases, these district court case files have been transferred to us for safe keeping. Or how about the person who is attempting to correct a mistake on their birth certificate or to obtain one for the first time. School district census records and newspaper birth announcements in our collection are invaluable to these citizens in proving their name, date and place of birth to the Vital Statistics office. 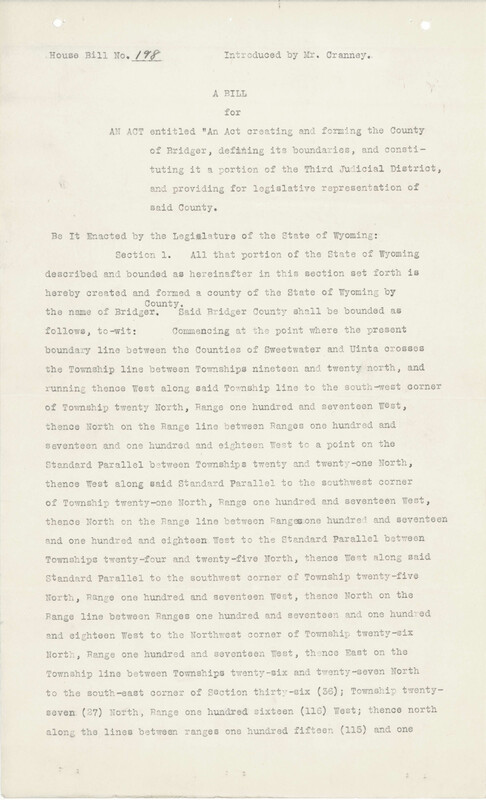 Court case files and school district census records are less interesting to look at than historical material, but they can have a profound impact on the life of Wyoming citizens. Proof of high school graduation has become a standard request for many employers looking to verify the credentials of potential employees as well as for non-traditional students going to college for the first time. Since the majority of Wyoming high schools transfer their inactive student records to us, there is a good chance that these folks will need to talk to us. Oil and gas leases are big business and new oil and gas discoveries in the last few years have increased the number of researchers looking into land titles and mineral rights. 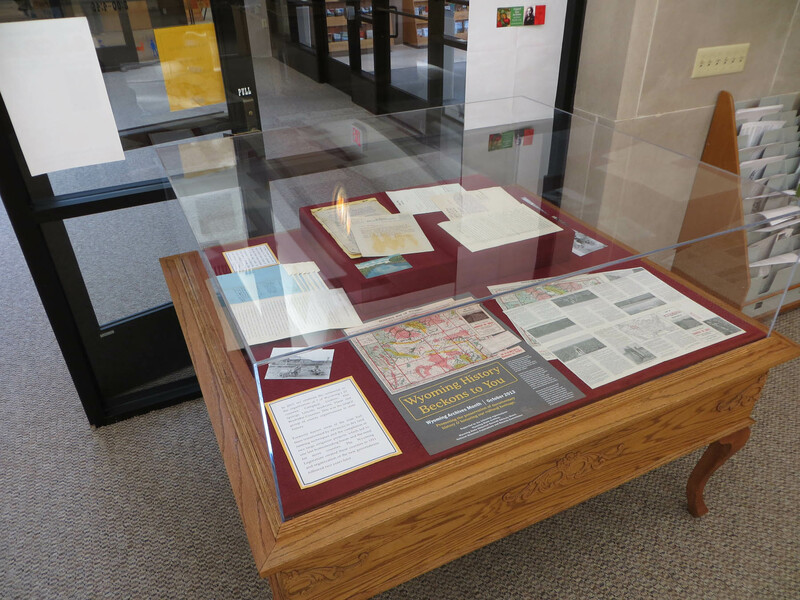 Thanks to a microfilming project in the 1960s, we have copies of all 23 county clerks’ land records up to the mid-1960s available here in the reading room, lessening the wear and tear on both the original documents and the clerks’ staffs. Several clerks have also transferred their original record books to us, too. And then there are the district court probate files that record the distribution of these properties through estates to heirs. Without a clear chain of title, drilling may be delayed or even abandoned and royalty checks would not make it to their rightful recipients. Uinta County Clerk deed books and mortgage index books on the shelf the shelf at Archives South. By statue, open public records must be available to citizens who request to view these documents, but the process can be come a logistical nightmare for staff in small offices with less than ideal storage situations. At a time when budgets are being stretched to their limits, few agencies and counties have the money for additional staff to manage and accessing inactive records or to build courthouse additions to store those same inactive records. But they don’t always need to. Instead, they can often utilize our staff and storage space, freeing themselves to focus on new record creation. This increased efficiency leads to a monetary saving to taxpayers who are not asked to approve additional funding for capitol construction projects or hiring additional staff. 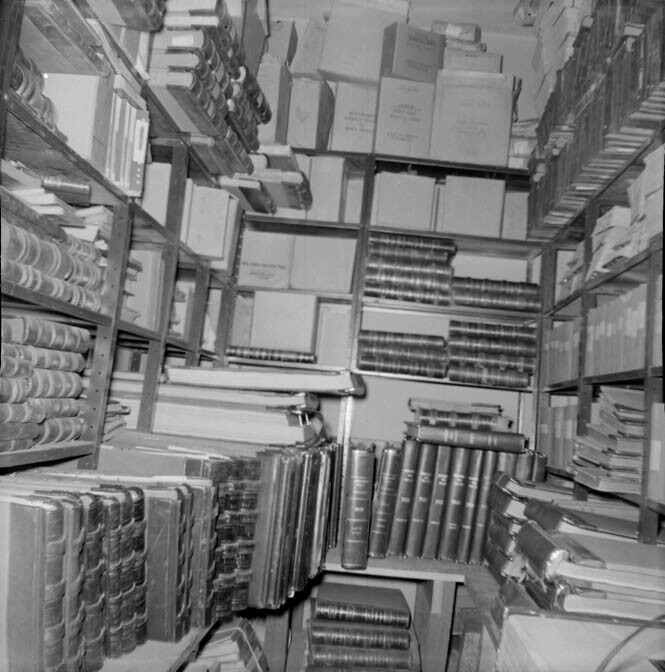 Laramie County Treasurer’s Office vault in the 1970s before many of the books were transferred to the Archives. 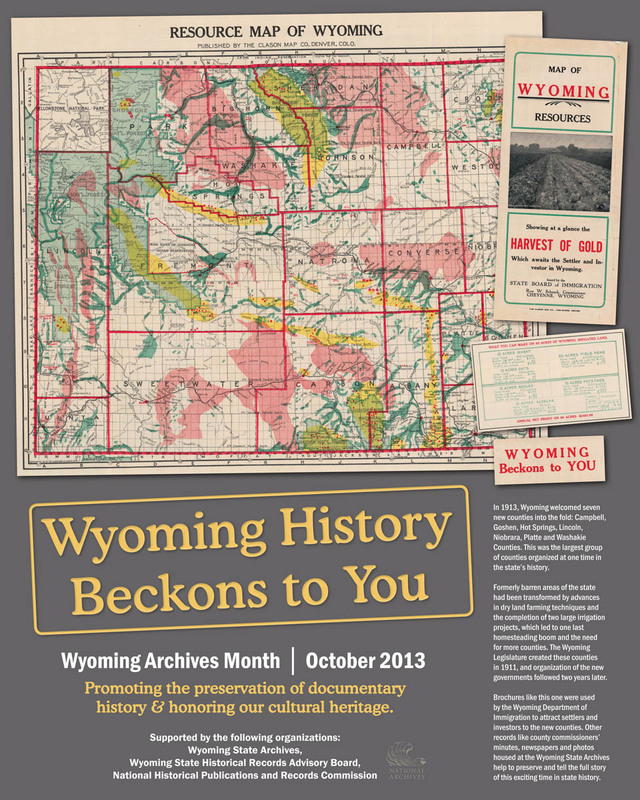 Thank you for taking the time this October to go behind the scenes with us and explore the work we do here at the Archives to keep Wyoming’s documentary heritage available for future researchers. We love what we do and are passionate about archives and records management. As always, we invite you to visit the Archives on your next trip to Cheyenne or contact us with any questions. We have a LOT of records here at the Archives. And I mean a LOT! Looking down the main aisle of Archives South, our off-site storage building. 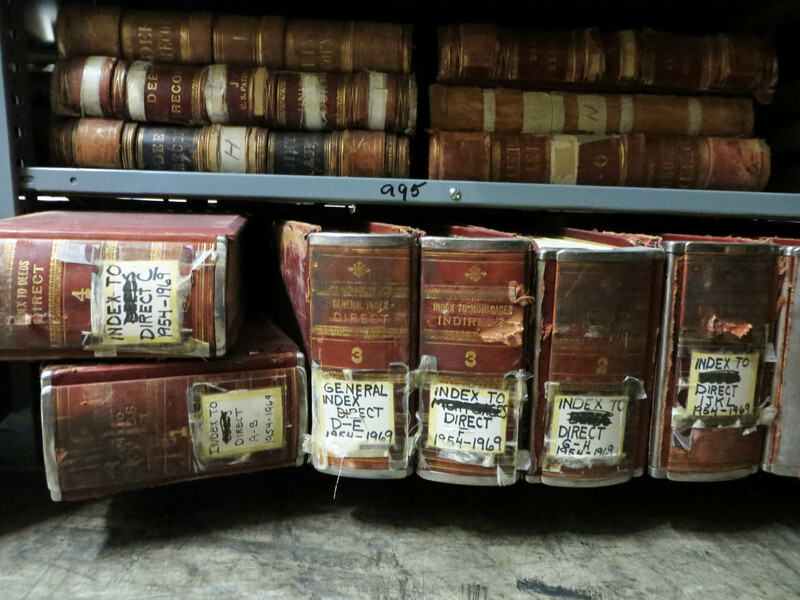 The bound volumes are county clerk record books from across the state. All told, we have roughly 84,000 cubic feet of material between the Archives (permanent records) and State Records Center (semi-permanent records), and that number is growing all the time. The wall of boxes on the main aisle of the State Records Center. Each of those boxes is considered 1 cubic foot. And they are stacked 2 deep on the shelves! So where do the records come from? The quick answer is from everywhere. The vast majority of records are transferred to us from state and county offices. These are records that have been designated as semi-permanent or permanent records and are no longer in regular use by the departments who created them. In many cases, the agencies do not have the space to store the records, nor the staff to provide adequate access them. That is where we come in. 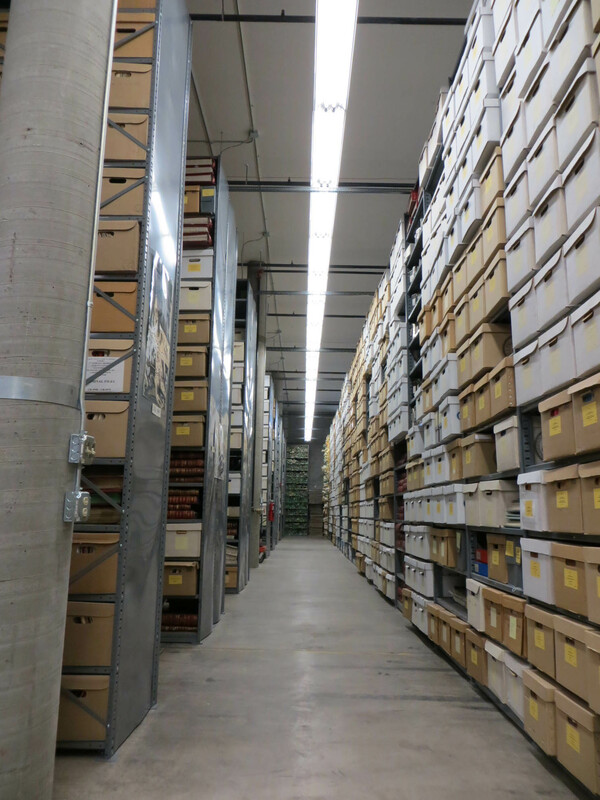 The Archives centralizes the storage and reference access to these little used but still vital records, freeing space and staff time for the creating agencies. While some agencies are able to bring their boxes to us, others rely on our annual transfer trips. Every summer we send out two staff members in a truck for 3-4 days travel in one of three regions to pick up records. This year, we picked up nearly 400 cubic feet! Records Analyst Lisa Hasting, in red, stacks boxes in the truck during a transfer trip stop in Casper this June. The rest of our collection has come to us by generous donation from the public. These are non-governmental records, like photographs, manuscripts, family, business and club papers. We are always excited to see what treasures folks have found and brought in. 1010 = Electronic Records Day! 1. Managing electronic records is like caring for a perpetual toddler: they need regular attention and care in order to remain accessible. 2. Electronic records can become unreadable very quickly. While records on paper can sometimes be read after thousands of years, digital files can be virtually inaccessible after just a few. 3. Scanning paper records is not the end of the preservation process: it is the beginning. Careful planning for ongoing management expenses must be involved as well. 4. There are no permanent storage media. Hard drives, CDs, Magnetic tape or any other storage formats will need to be tested and replaced on a regular schedule. Proactive management is required to avoid catastrophic loss of records. 5. The lack of a “physical” presence can make it very easy to lose track of electronic records. Special care must be taken to ensure they remain in controlled custody and do not get lost in masses of other data. 6. Shared documents can be hard to authenticate. It is easy to create copies of electronic records and share them with others, but this can raise concerns about the authenticity of those records. Extra security precautions are needed to ensure e-records are not altered inappropriately. 7. The best time to plan for electronic records preservation is when they are created. Don’t wait until software is being replaced or a project is ending to think about how records are going to be preserved. 8. No one system you buy will solve all your e-records problems. Despite what vendors say, there’s no magic bullet that will manage and preserve your e-records for you. 9. Well managed electronic records can help ensure the rights of the public through greater accessibility than ever before. This can only happen if creators, managers and users all recognize their importance and contribute resources to their preservation. 10. While they may seem commonplace now, electronic records will form the backbone of the historical record for researchers of the future. Remember, archivists and records managers are here to help you tackle these difficult problems. Contact us here at the Archives if you have questions or would like to learn more about our current digital repository project. Through this project, we hope to ensure that electronic records created today by Wyoming State government offices remain accessible for generations to come! P.S. Wondering how digital records are important to the individual and how to mitigate risks to your personal files? Check out this great video from the Library of Congress. Big books are not rare here in the Archives, but one set takes the cake. That is one BIG book! Measuring a staggering 20 inches x 40 inches x 3 inches, and requiring 2 staff member to move, the Laramie County Combined Assessment Roll and Tax List, Real and Personal Property, and Poll books from the first quarter of the 1900’s are massive. When open, the books spans 2 carts and 77 inches! So why would a county possibly need with a book this big? 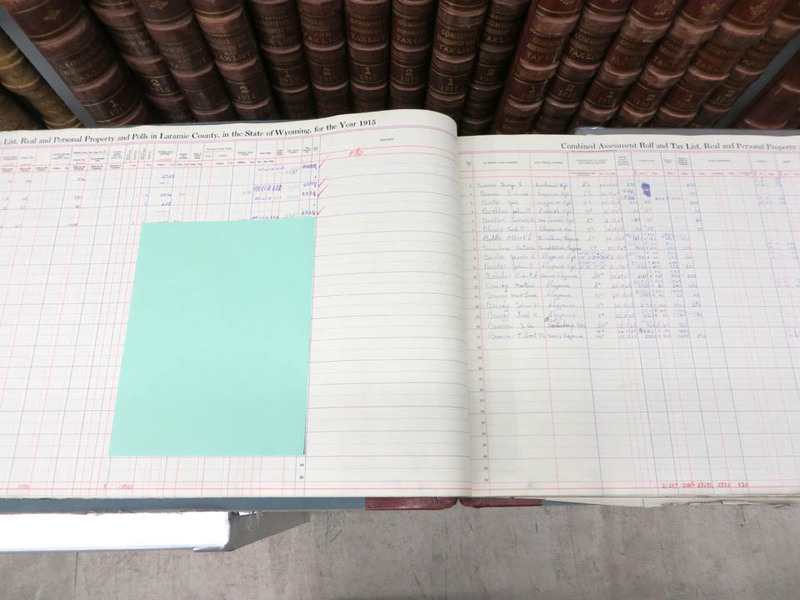 As the title says, these books were kept by the County Assessors Office to keep track of tax assessment rates, whether the taxes were paid, and also functioned as voters registration records all in one place, rather than in 3 separate books. The green paper is a standard letter size 8.5″ x 11″. Due to the size of the books, it is difficult to bring the originals in for research. For this reason, the books are available on microfilm in the Reading Room, saving the books (and our backs!) from wear and tear. One of the most asked questions by researchers visiting our Reading Room is “Where do you store all of your records?” The true archival enthusiast usually follows that question with “Can I see?” In the spirit of these inquiries, here is an illustrated overview of our storage areas. Two of our storage areas are located on-site at the Barrett Building. 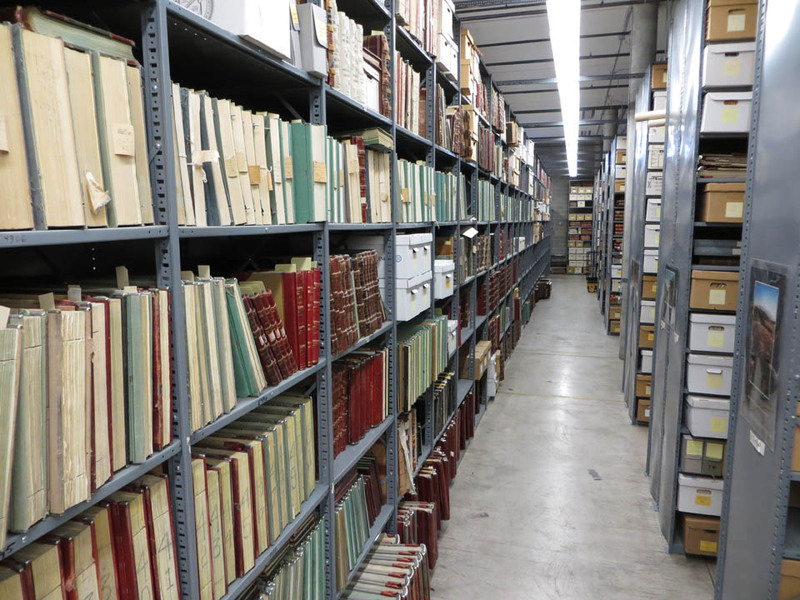 We currently house around 84,000 cubic feet of records in the Archives and State Records Center. The boxes and volumes are stored in one of three storage areas, two within our building and one in a building on the other side of town. Rolling shelving saves space in the Records Room. The first of the storage areas in the building is directly off the Reading Room and is fondly called the Records Room. Because of its convenient location, this is where we store the records that are requested most often and those that require the most regulated environment. 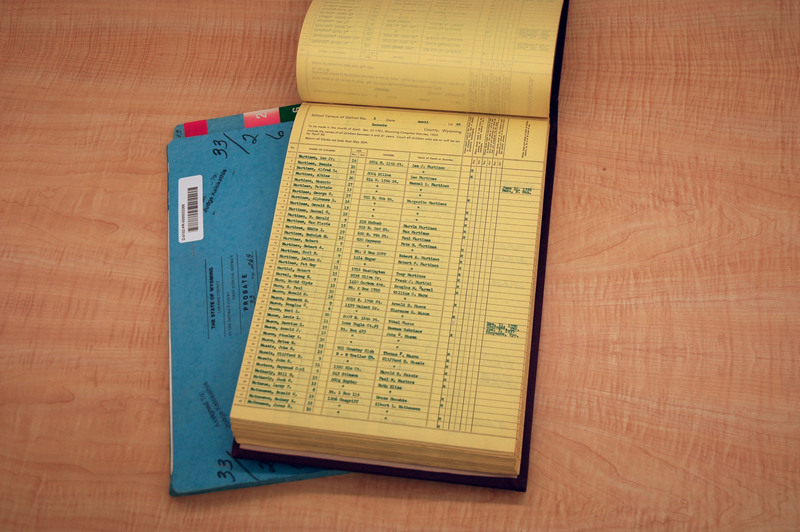 These records include high school transcripts, governor’s records, Secretary of State corporation files, school district censuses, early Board of Charities and Reform inmate files and mug shots, and all of our non-government collections. Our photograph files, historic maps, oral history collection and historical library of books related to Wyoming history are also found here. One drawer of many that hold rolls of security microfilm. The second on-site storage area is not quite as convenient, but it still offers a very stable environment. 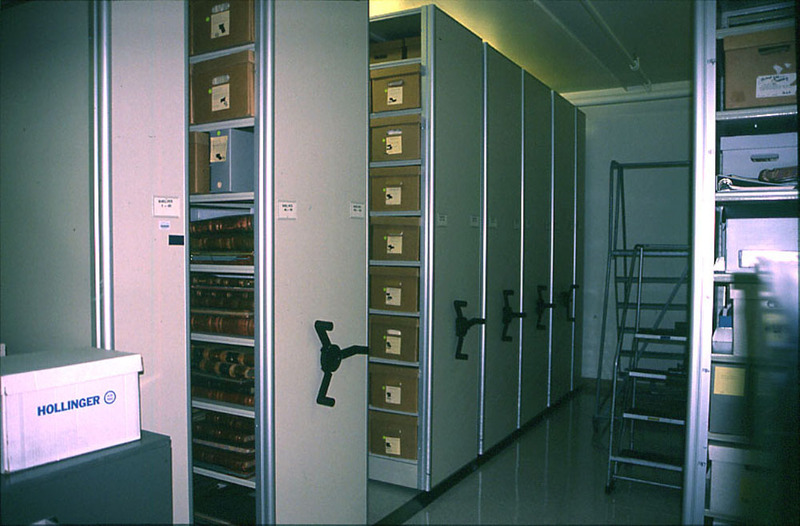 While we call it the Microfilm Vault, it is more of a storeroom than a true vault. Here, we keep the security copies of our microfilm (we can use these to create high quality duplicates for research as needed). Our photograph collection negatives and over-sized prints also live here. Looking down main aisle of shelving at Archives South. The State Records Center is on the other side of the long wall to the right and looks very similar. 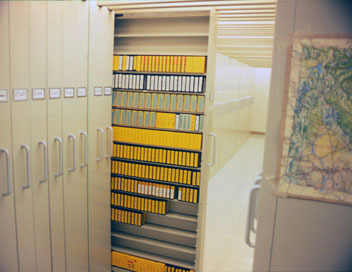 Archives South/State Records Center, our off-site facility, houses the majority of our holdings. The State Records Center provides state and local offices with a safe, secure and efficient off-site storage for their semi-permanent records. Semi-permanent records are those that are no longer needed for daily business, but must be kept for a specified period of time before they are destroyed. Archives South stores permanent records that are not used as frequently as those on-site. 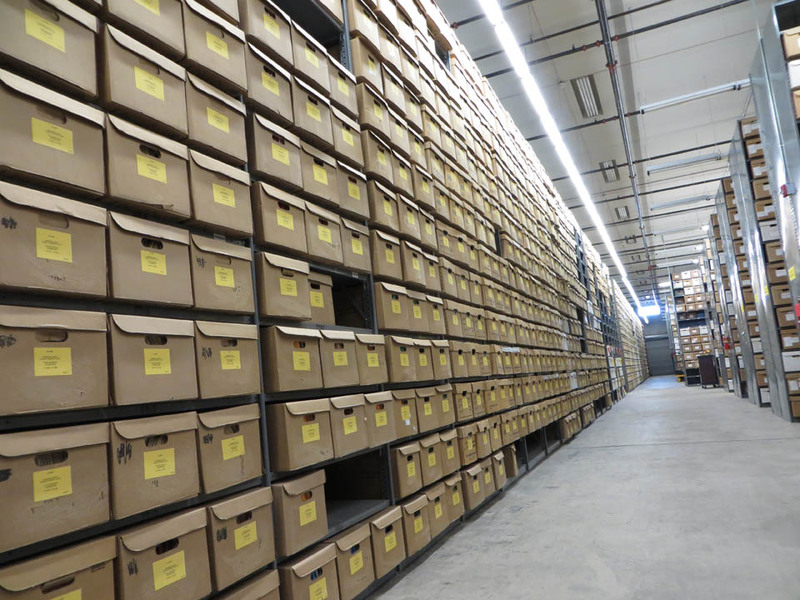 Court case files, original county clerk record books, commercial and residential building plans, and nearly all of the state agency records are stored here. Throughout the month of October, the Wyoming State Archives is joining with archives across the nation to celebrate our shared memory and promote archival appreciation. What better way to start off our new blog than with a celebration with all things archives! The Barrett Building, our beautiful home. 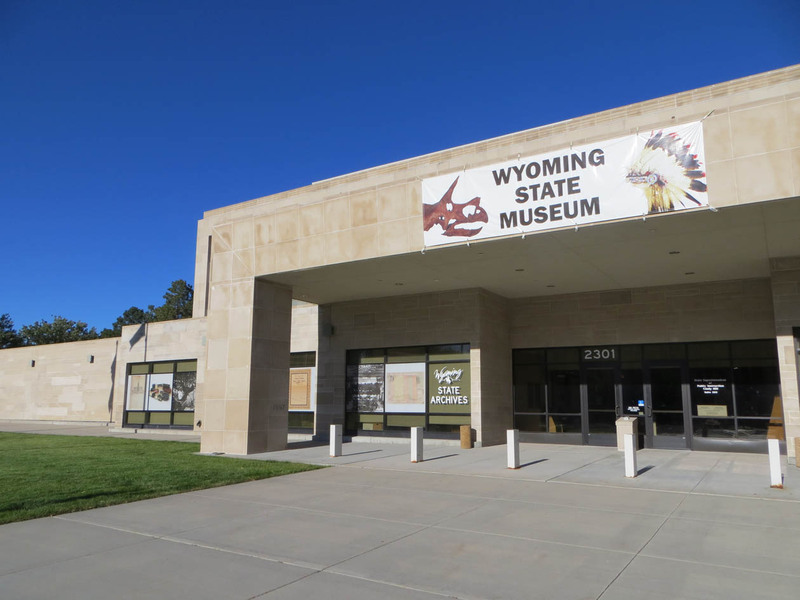 The Wyoming State Archives is a government agency, under the Department of State Parks and Cultural Resources, tasked with managing the records of Wyoming’s state government and assisting county and local governments with their records. We do this through our 3 units: Records Management, the State Archives, and the State Imaging Center. Records Management helps agencies and departments to sort through the records and documents they create daily and decide what needs to be kept and for how long. 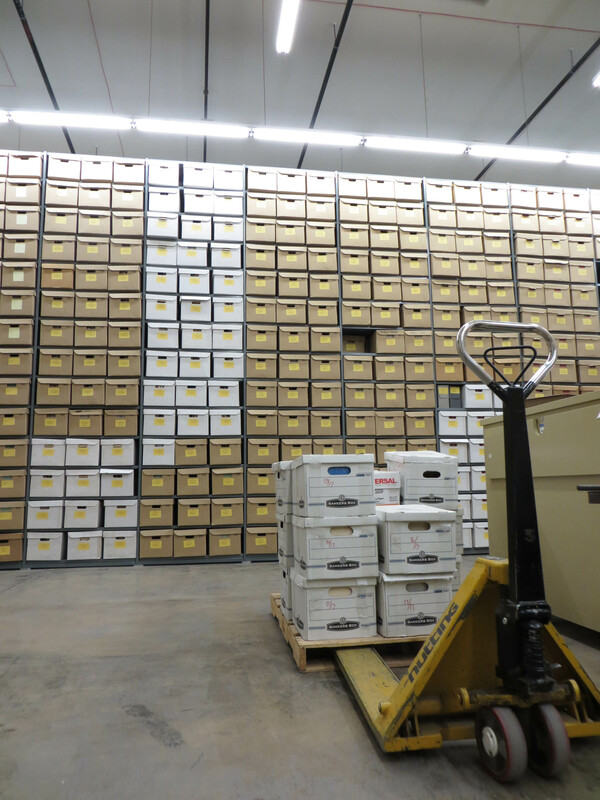 Records Management also runs the Wyoming State Records Center (SRC), a repository for state government’s semi-permanent records. These are records that are no longer need for daily business, but must be kept for a certain amount of time before they are destroyed. A wall of boxes in our off-site facility, Archives South/State Records Center. 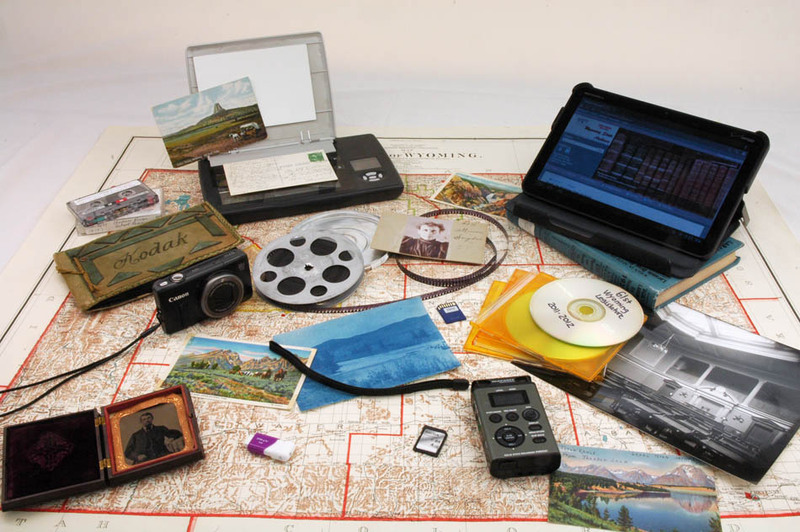 If a state or local record is deemed as having lasting historical, informational or evidential value to the citizens of Wyoming, it is transferred to the Wyoming State Archives for permanent storage and research access. Unlike in most other states, the Archives is also home to many non-governmental records. 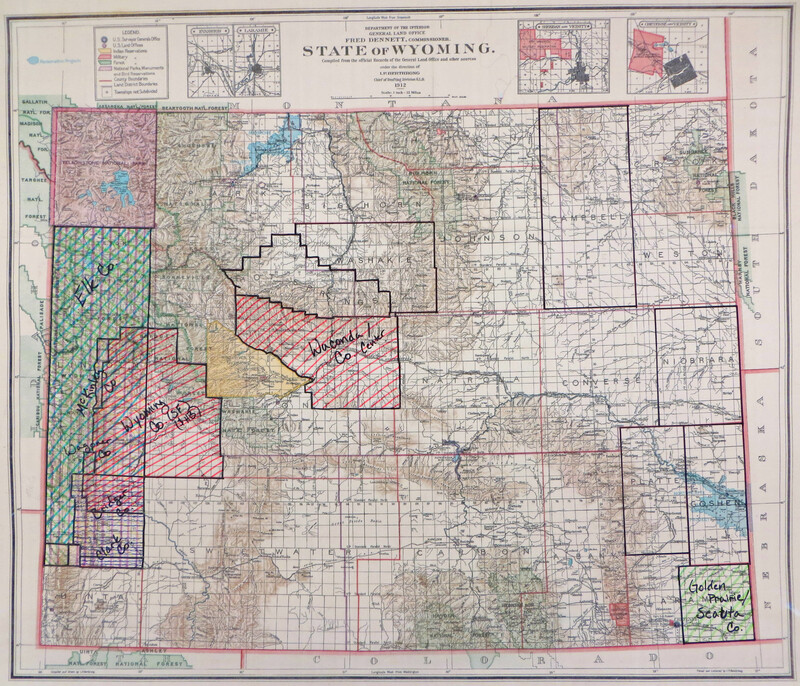 Our collection contains the papers of Wyoming pioneers, local clubs and organizations, newspapers, photographs, maps and much more, all relating to the history of Wyoming and its people. The State Imaging Center oversee major scanning and microfilming projects for permanent records. These folks use scanners and cameras to digitize and microfilm large volumes of documents. Sometimes the paper documents are then destroyed to save physical storage space, but sometimes the originals are also kept because the paper they are on is seen as having its own intrinsic value (more on that later). 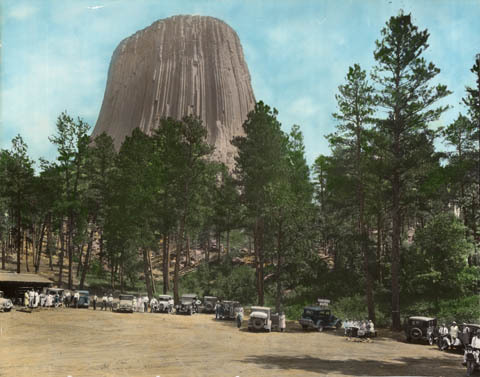 The Wyoming State Archives exists to be the enduring memory of Wyoming’s state governmental history for the citizens of Wyoming and to ensure that the information and documents that keep our government running smoothly survive for the future. We also strive make the history of Wyoming and its people available to present and future researchers so that the stories of the people and events that built our great state are not lost to the sands of time. 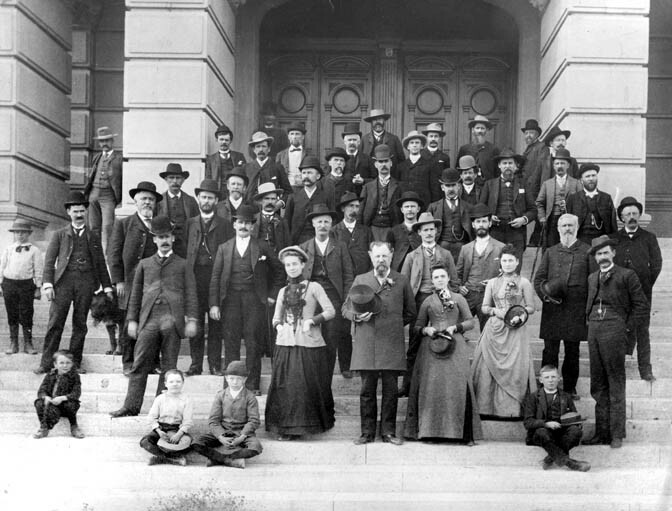 Members of the Wyoming Constitutional Convention on the steps of the stat capitol building, 1889.